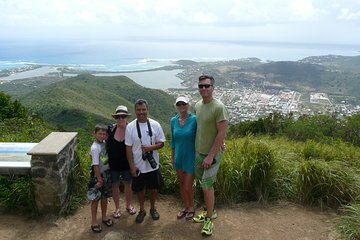 Visit the island's highest peak, take a nature walk and go snorkeling on this 4-hour nature tour from Philipsburg. With your expert nature guide, head to the top of Pic Paradis, the tallest peak on the island, for views of the landscape and the sea beyond. At a saltwater pond, get glimpses of local wildlife like lizards, birds and iguanas. Then dive in to a calm bay to explore the underwater world on a snorkeling adventure. Along the way, stop for coffee, tea and cake. Round-trip transportation from select hotels is included. We were on a cruise Celebrity Silhouette March 28, 2019. There are 4 of us on this tour with David the tour guide. He pick us up on time and started the tour right away. My feeling we were on a group tour but turned out to be a private tour. Excellent service with details of the island. David provided us homemade snacks and drinks which are not mentioned on the tour. Overall we had a great experience with David. I enjoyed this excursion. Our tour guide was knowledgeable about the island. We went to both sides. Took a moderate hike up to a great lookout point. The snorkeling was also enjoyable as we saw a damaged keel from the big hurricane. A snack was provided of delicious banana bread.